I had read about the ceremony a long time before I ever went to sea and had seen pictures in my grandfather’s collection of navy books. 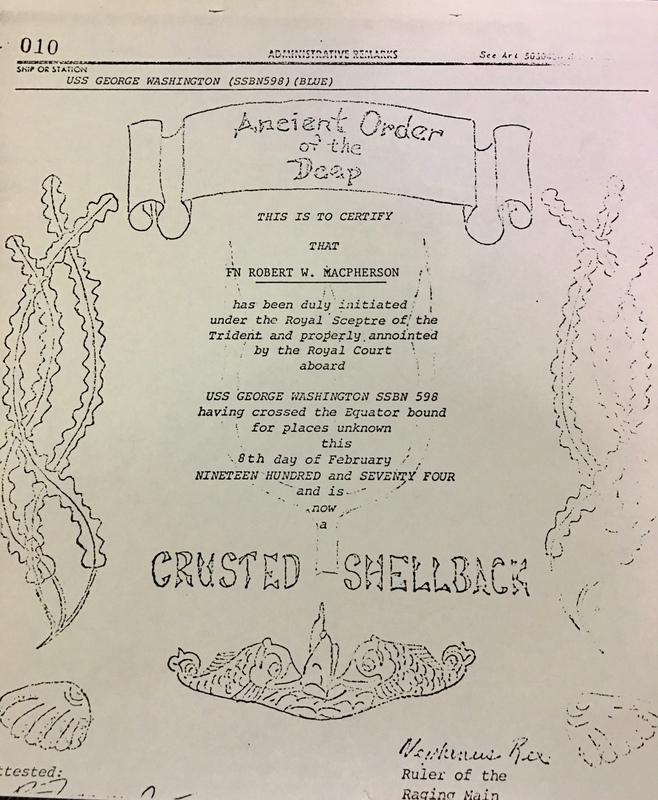 The ceremony itself is said to go back at least 400 years (according to most written records) and it is considered a high honor to make the transition from pollywog to Shellback. At least that is what the Petty Officers who were preparing us were telling us. The tradition on a surface ship involves a lot of open spaces and it would seem to me that the mess that goes along with the initiation would be easier to clean up with fire hoses. 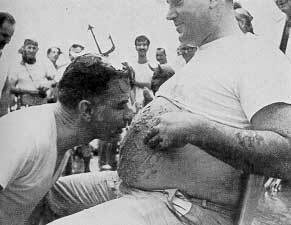 One of the most famous initiations happened on board the USS Indianapolis (a cruiser) in 1936. Disregard of the traditions of the sea. Taking liberties with the piscatorial subjects of His Majesty Neptunus Rex. Needless to say, if the President of the United States had to go through the ceremony, a Machinist Mate Fireman would have to take his turn too. The threat at the time was that if you didn’t participate, it would be entered into your service record that you were uninitiated and that would follow you throughout your career. The initiation on the GW was a memorable one. Poly sheets were draped from the berthing areas into the galley to try and contain the garbage and food waste that had been stored up for days leading up to the event. As a pollywog, you were forced to transit in the mess on your belly as you approached the royal throne. The smell was horrendous. The paddling along the way was also pretty interesting. This was all done in a time when no one would dare to write a letter to a congressman about ill treatment. You just endured what you had to endure and moved along. I will spare you the details, but rest assured that the sight of an air powered grease gun did not give me any feeling of comfort. The water resistant grease used on submarines has a distinct smell and is incredibly hard to wash off. The operator was very generous with his application. Pollywogs apparently squeak if they are not properly lubricated. The truth serum was the foulest tasting brew I can ever imagine tasting. You were asked a question and no matter what the answer you would be branded as a bold faced liar and more truth serum was applied. Unfortunately, it often caused the fellows to regurgitate. Since the garbage shoot only had a single path in one direction, you just crawled through anything that was in your path. After receiving your charges, there was more harassment while you were in line to kiss the Royal Baby’s belly. In our case, this meant that you had to somehow free the slimy truth serum covered olive from the belly button of one of the fattest sailors on the boat. On your knees and with no hands allowed. The only way you would pass to the other side was to show the olive in your teeth to the royal doctor. Finally, you crawled out and started the cleanup. The last indignity was that until the end of the ceremony, all of the wogs had to wait in their stinking clothes. Once the wogs were complete, they were responsible for cleaning up the mess left behind. (to be honest, I think it ended up being an all hands evolution but I can’t remember a lot of details from the moment I exited the mess decks until that evening). But we all survived. We all become members of an exclusive club called Shellback. 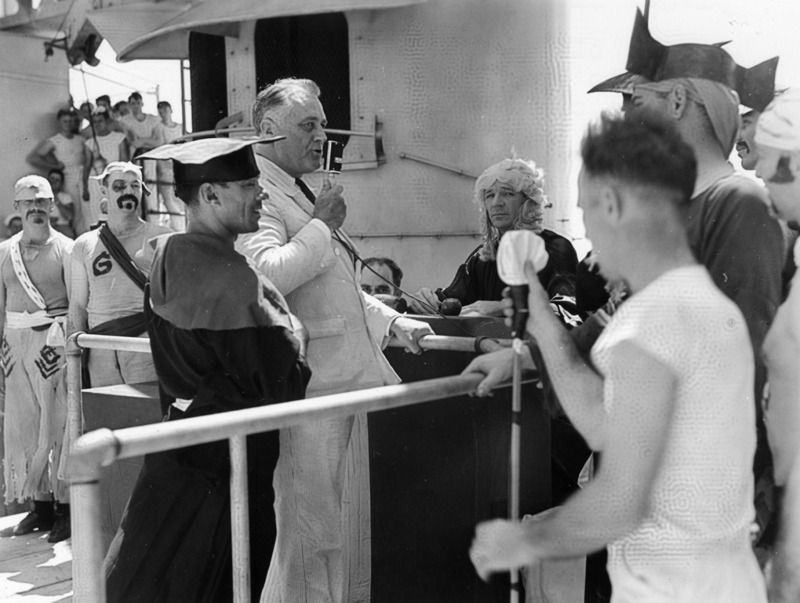 A little sorer and certainly a lot more tired, we joined long line of seagoing men who would have an official entry in their service records. 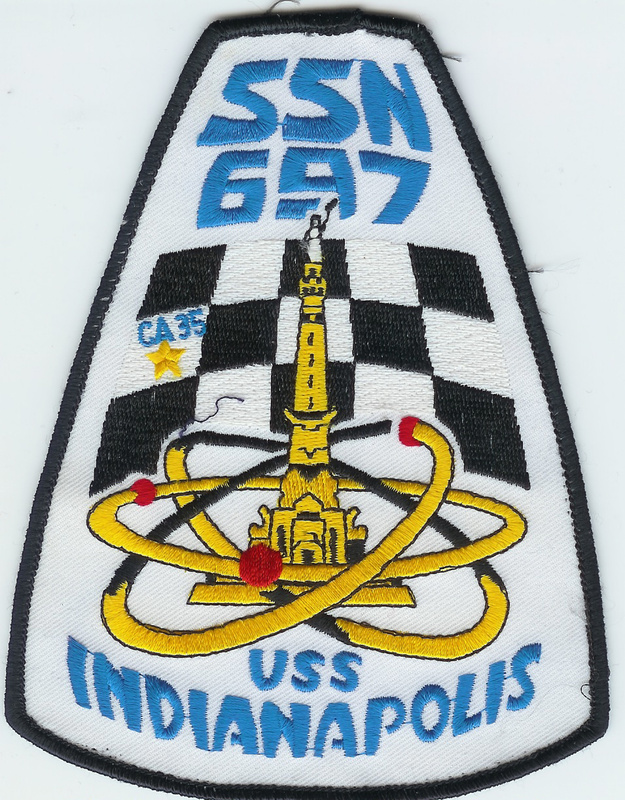 Years later, I was one of the Shellbacks on another submarine (USS San Francisco). It was good to be on the giving end this time, but I still to this day hate the smell. The only other time I had such an indignity was when I was properly initiated as a Chief Petty Officer. That story is for another day, but again, I would not trade that day for any other in my life. Logan Elsworth Ruggles was the Chief Printer in the United States Navy when this book was published in 1918. It was dedicated to his shipmates… Past, Present and Future. Also crossing the Equator, or being converted into a trusty shellback. 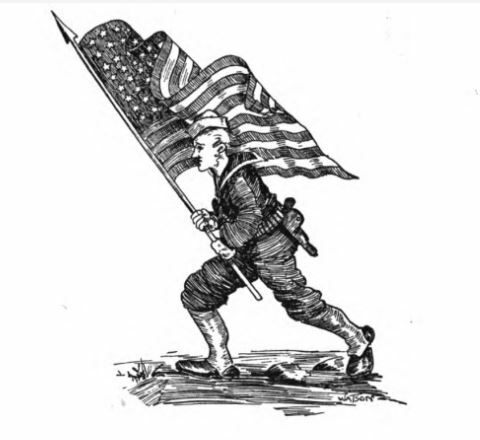 The story is old to the service men of years back, but owing to the thousands of new men now in the navy, the writer is causing to be published herewith the following. This is typical of the ships of some few years ago and on this vessel it was said by officers and older service men that it was one of the most successful Neptune Rex parties that they had ever witnessed. This description of the occasion was so complete that it was published in many of the leading papers of the country and it is believed that the explanation will not only meet with the approval of the navy men but also serve as a very instructive addition to the book for those in civil life. It should be mentioned, however, that this practice is no longer in force during the war. Domain of his Majesty, Neptunus Rex, Equatorial Regions, April 13, 1910. ‘”Being a landlubber and daring to enter our Aqueous and Equinoctial Regions without due and submissive ceremony, you are hereby ordered and directed to appear in person before my most August Presence in Latitude 00, Longitude 80, on April 14, 1910, to explain your most contumacious conduct, and to accept most heartily and with good grace the pains and penalties of the awful tortures that will be inflicted upon you that you may become an honored shellback. 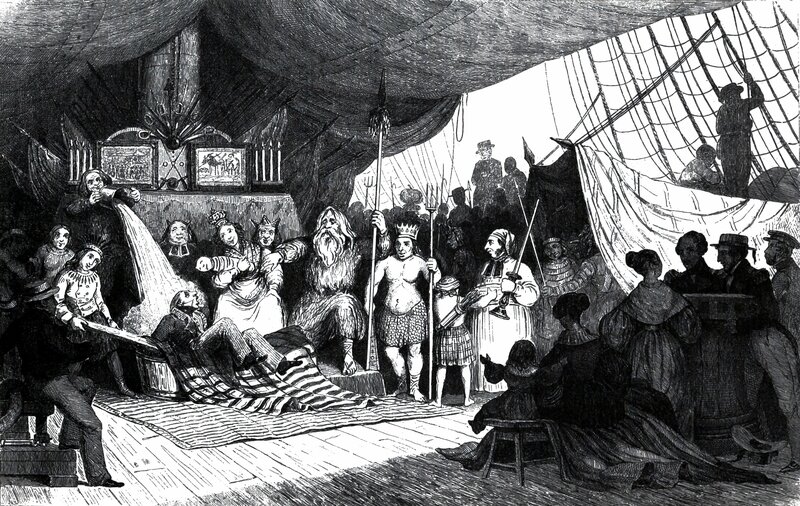 This summons was issued to every officer and man who had not been previously initiated, shortly after the visit of the king’s messenger, who hailed the ship and appeared over the bow at 7.30 P. M. on the 13th. He officially visited the officer of the deck, and later called upon the captain on the quarterdeck. He predicted great things for the morrow, and expressed the opinion that some of the crew might profit by preparing for a typhoon, after which he disappeared to report to his imperial master. In the meantime the large tank was being rigged on the starboard side of the forecastle by the ship’s carpenters and other trusty shellbacks, who had crossed the Equator before and were familiar with the solemn mysteries of the deep. All the while, the costumes, unique and gaudy, were being prepared for the king’s visit. At 9:15 on the morning of the 14th, Neptune Rex and his court retinue boarded the ship over the bow and, to the strains of his band, mysterious and discordant to us, but possibly of excellent musical value to him, they marched to the quarterdeck and assembled company front. The king introduced his lovely queen, Amphitrite, to the commanding officer, and had a some-what lengthy conversation with him regarding, we suppose, the position of the ship, its course and the duties of the king’s court while aboard. The king was picturesque, as he usually is at this ceremony, but seemed to look much younger than on his former visits, according to the old-timers. His new wife, the other Amphitrite having left Neptune’s domain some time since, was very handsome, and although the king was reticent in regard to her, her beautiful brunette hair and fair features certainly bespoke of Andromeda, who must have divorced Perseus. Be what it may, she was a very noble looking queen, and she drew considerable attention. The admiral of the court was, of course, present in full regalia, and he was busily engaged in actually “shooting” the sun with a gun he pulled from his boot leg. His chronometer and sextant were very accurate, though of ancient make, and his chart resembled the last page of a Sunday funny sheet. 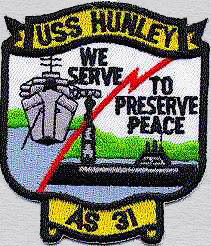 At this time there was a signal given and the entire party went below, not to “splice the main brace,” but, as the modern sailor expresses it, to “brace the main stay.” The little boatswain piped all hands forward, especially the landlubbers, to the forecastle, and there was a grand rush by every “honored shellback” to get the best seat to watch the victims go through the mill as they had years before. There must have been something very interesting down below, as it was a long while before Neptune and his party arrived at the platform to administer the solemn rites. Seated on their throne the king and queen received the first victim, who happened to be a lieutenant of marines. He was registered by the secretary, questioned, given a dose of medicine and a pill that would choke an ox, treated to an electric cure for insomnia, lathered, shaved and shampooed, with a little ointment of what they called balm of Gilead; he was then thrown into the tank and was at the mercy of the bears. A midshipman followed the lieutenant, and was directed to shine the official coffee pot. Every officer who had not gone through the initiatory before was made to take the same medicine as the newest recruit on the ship. There is no way to get out of it, the secretary has your name, and if you are not there to answer as your name is called, the court policeman will look you up, and the initiation will be double. “To all sailors whoever ye may be, and to all mermaids, sea serpents, whales, sharks, porpoises, dolphins, skates, eels, suckers, lobsters, crabs, pollywogs and other beings of the sea, greetings. Know ye that on this day in latitude 00, longitude 80, there appeared within the limits of our royal domain the ship. Be it remembered that the said vessel and officers and crew thereof, have been inspected and passed upon by ourselves and our royal staff. “And be it known by all ye sailors, marines, landlubbers and others who may be honored by his presence, that having been found worthy to be numbered as one of our trusty shellbacks, has been gathered to our fold and duly initiated into the solemn mysteries of the deep. Be it further understood that, by virtue of the power invested in me, I hereby command all my subjects to show due honor and respect to him whenever he may enter our realm. Disobey this order under the penalty of our royal displeasure. Given under our hand and seal this (date). “NEPTUNUS REX, “DAVY JONES, “Ruler of the Raging Main. 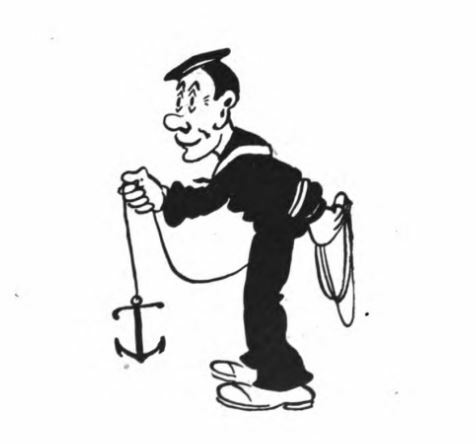 when the full traditions of the Navy were still in effect. There was no sugar coating and we did what a long line of sailors did before we were even born. To be fair, I cursed a few times on the way through the line on my way to the throne. Each curse that as heard was rewarded with an appropriate response. I quickly learned to curse in silence until the ordeal was over. But I am glad I did it. It was a part of my story as a sailor. None of this story is meant to diminish those who are not allowed to go through their own version of this ceremony today. I understand the reasons why the brass made the changes. You really can’t blame the sailors today for the regulations that have softened the traditions in so many ways. Hell, to be truthful, those guys in 1918 may have thought our initiation was too soft and cushy compared to their own. The world is still filled with pollywogs and Shellbacks. But the number of true Shellbacks grows smaller with each passing year. As the lights grow dimmer in my wheelhouse and I approach the closing days of my voyage, I wanted to write down a few memories that may resonate with some of my shipmates from that era. Looking back over all those years, I wouldn’t change a thing. Arrrgh! Well do I remember and my imagination is such that I will now defer on the lunch that I was planning (warmed up chili ala’ Tijuana [not authentic though as I do not use dog, only ground beef]). Somehow it seemed the better part of valor to turn off the burner under the pot and allow the contents to cool to be returned to the refrigerator for another time. Good memories though, Mister Mac. 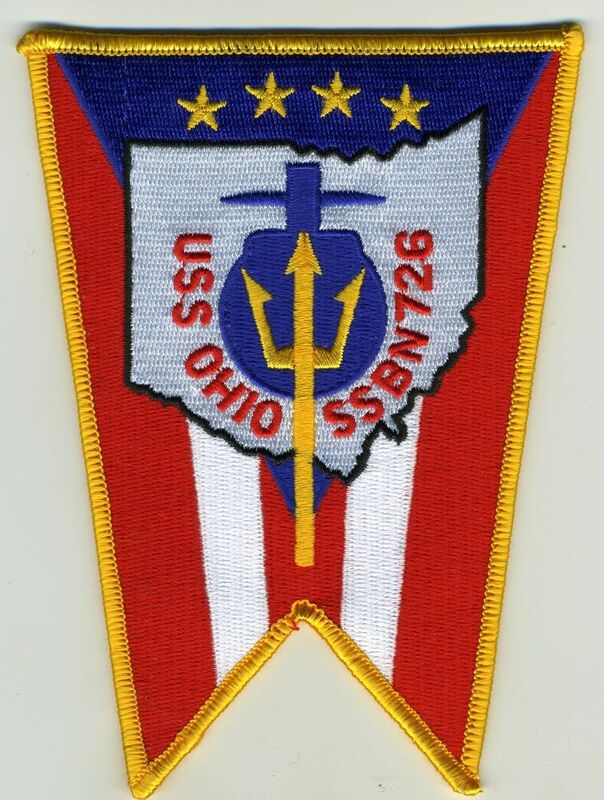 I went through the ceremony on a Peruvian transport (BPA INDEPENDENCIA, ex-USN BELLETRIX) in 1976 off Ecuador, a fact that was validated through the US Embassy in Lima, Peru in 1977 when I was serving in Japan in USS FIRST SHIP. I am fortunate to own a copy of the 1961 book “”Crossing the Equator” by Henning Henningsen, which states the earliest documented crossing the line ceremony was in 1529 aboard the French ship BROTHERS PARMENTIER though the ceremony is much older than that even then, obviously. A couple of interesting points from Henningsen: The Bears are an English Tradition, and nowhere in the book does he mention the Royal Baby. On the Peruvian ship we were whacked across the shoulders by a leather fish after being “baptized: in a large tank of salt water. I share Mister Mac’s pride! PreviousCan the Groundhog see his shadow underwater?